This page is in honor of all those animals we have here that are sanctuary animals. They've had a bad start in life or are special needs but are loved all the same. They are our mascots and inspire all who meet them. Matilda came to us from a breeder who "had no use for her" and was going to send her Rogers sale in OH if no one took her. As anyone in this area knows, Rogers is mostly for meat rabbits. We couldn't let that happen to this beautiful girl! Matilda apparently developed an ear infection at around 8 weeks of age. Her breeder treated her with antibiotics for sheep which didn't really help and then gave up on her completely. When we took her in, she could barely stand up. Her head was tilted so badly, she would flip and roll trying to find her balance. She had "Nystagmus" really bad which means her eyes would literally vibrate in head. Her down eye was rolled back into her head. But she showed heart. She tried to get up, she tried to get around, she begged for cuddles and would eat anything you put in front of her. We know she had a will to live and we were willing to fight for her. 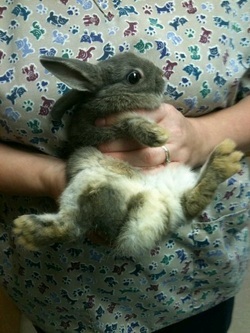 We began treatment for any leftover infection and possibly swelling. We made sure she was comfy and secure, putting up soft "bumpers" in her cage to make sure she didn't flip and hurt herself. She began showing signs of improvement and got continually better. Matilda can now get around perfectly, only occasionally flipping when she gets upset. 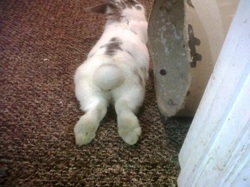 She runs and plays and binkies, and though always on an angle, loves her life! She is one of the happiest, affectionate bunnies we have ever had and she will always be our inspiration for doing what we do. Usually when people come to visit, they immediately, when they see her tilt, say "Poor girl." But it only takes a small amount of time before they have completely switched around and tell us how happy and lucky she is. She loves her life and you can see it. We recently took her to a specialist who said that you shouldn't pity her. This is her "normal." This is what she's used to and she has adapted just fine. She proves just how wonderful rabbits are :) And she has doubled the love by living with two other special bunnies that live here, Maddie and Sterling! 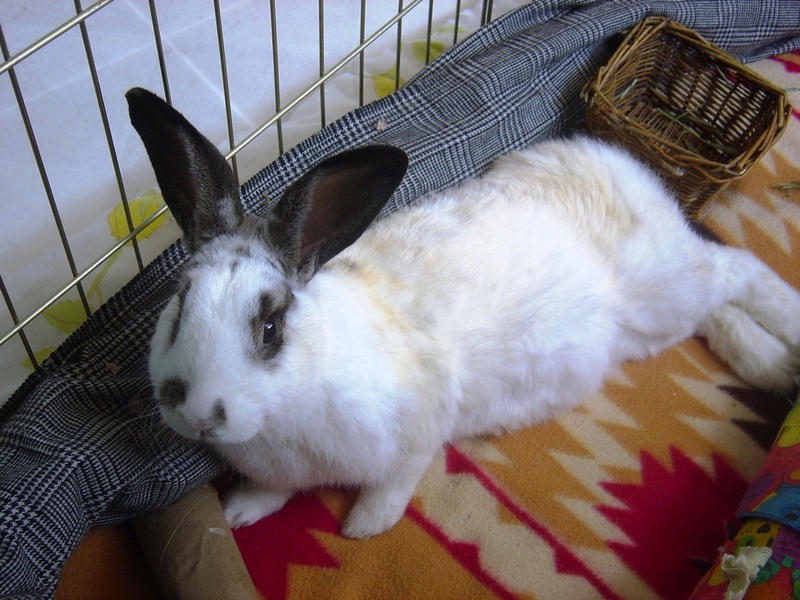 When we discovered Bean, she was being advertised on craigslist as a bunny with splayed legs who would do best with children or in a "classroom setting" (which anyone with bunnies knows that either of those is a bad choice for rabbits whether they are disabled or not). We took her into our rescue and brought her immediately to the vet. Bean's right two legs stick out at a right angle from her body. From how malformed they are, we originally though they were the product of some sort of abuse. After x-rays, we realized that her limbs were formed that way in the womb. We call her our "flipper bunny" as she flops around like a seal, but don't let that fool you :) She is one of the happiest bunnies we have here at the rescue and she can keep up with her boyfriend, a special needs bunny named Sampson, and binky with the best of them! 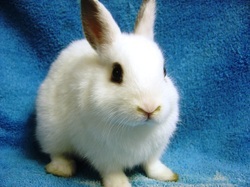 Due to her condition, she is a sanctuary bunny, here for the rest of her life. She may eventually require surgery or special padding/clothing to prevent sores and other injuries. Update 2014: Bean was adopted out with her boyfriend after we figured she was special but didn't need long term special care. She is now happily in her furever home! 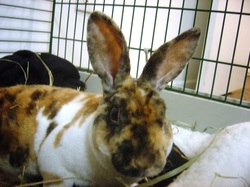 -Charles came to us after someone picked him up as a stray. Apparently he had been living in a neighborhood all summer. Charles has serious medical and possibly neurological conditions. He is unable to walk on his own and has a slight head tilt. 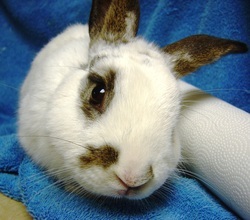 He is a fighter and such a sweet, happy little bunny boy despite his handicaps. We are taking donations for his care, but he will be disabled all his life and will not be adopted out. Update 2015: Charles is still a resident here and just turned four! He is mostly paralyzed but gets around well by dragging with his front legs. 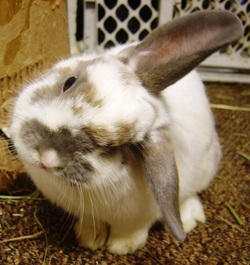 He is one of the most happy, spoiled bunnies at the rescue and when people come to visit, they have to pay the "Charles toll" when they first walk in, which is ear scritches and treats to make him happy! -Angus was rescued from a horrible pet store. They were selling him at MAYBE 5 weeks of age when he shouldn't have been separated from his mom until 8 weeks, plus him and his sister had bad URI's. Due to bad breeding and separating him from his momma too early, he has ongoing medical problems (respiratory issues and recurring gastric stasis problems) which will require him to live out the rest of his life here. We love Angus to bits and are happy he gets to spend the rest of his life here. We'll be bonding him with another resident Phoebe. Pictures to come soon! Update: Angus unfortunately passed away in 2013 due to complications from gastric stasis. We love him and miss him dearly.